My good friend Peter returned from Champagne the other day and to my great happiness, he came for dinner that very night. I love hanging out with Peter because he's a truly remarkable guy, and then there's also the wine thing - spending an evening drinking wine with him is like being in graduate school (but without the annoying homework or the crippling debt). During our conversation on this night I learned a lot about Austrian Riesling and changes in the Austrian wine industry in the 1980's. All of this was new to me, and I found it so interesting that I will try to recreate the conversation here. 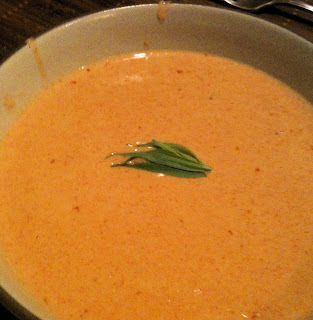 It began with lobster bisque that I brought back from Larson's Fish Market in Martha's Vineyard. What to drink with this very rich soup? 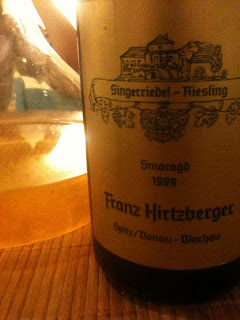 I was thinking of Champagne, or maybe a Huet demi-sec, but I remembered the 1999 Hirtzberger Riesling Smaragd Singerriedel that I bought about a year ago, on Peter's advice actually. I saw it one day just sitting there for $67 in the cold room at Astor. Curious about Austrian wine, I had asked Peter to recommend a few things to try. He said that the blue-chip wines include Hirtzberger's Singerriedel, Nikolaihof's Steiner Hund, Alzinger's Steinertal, Pichler's Kellerberg and Loibner Berg, and Prager's Achleiten (and more recently Wachstum Bodenstein), and that Singerriedel might be the greatest of the vineyard sites. We opened and decanted the wine. Peter generally does not decant wine, he prefers to experience its evolution from the bottle and the glass, but he told me always to decant Austrian white wines because they are made in such a reductive style. I thought the wine was gorgeous - rather full in body and quite ripe, but also entirely focused and under control, and as it interacted with air it became more and more detailed. 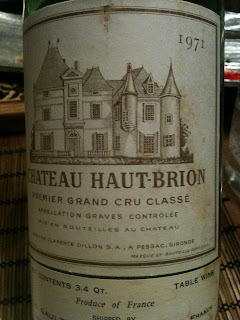 Peter said the wine was great and that it was very modern, a fantastic example of the style. "What do you mean, modern," I asked. "Well, the Austrian wine industry completely changed in 1985," he said. "You know about this, right?" "Nope. 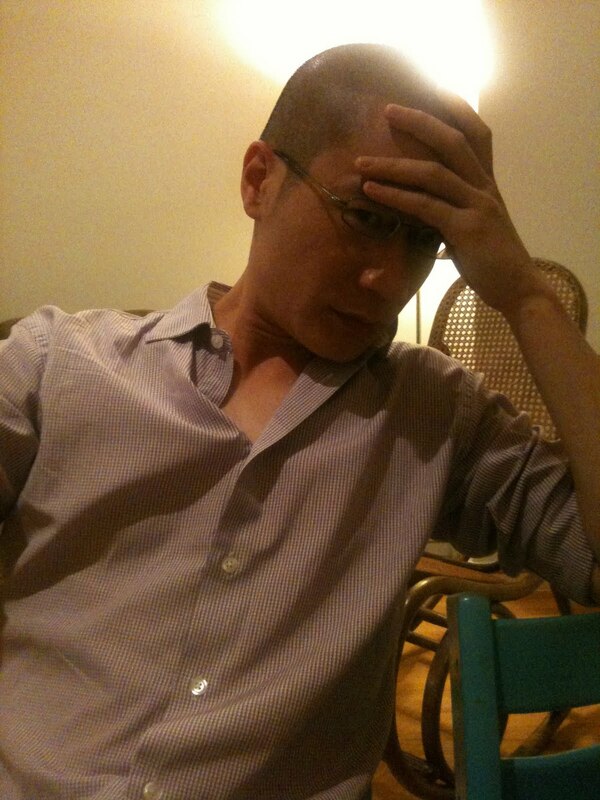 Completely ignorant," my vacant expression conveyed. "Austrian Riesling used to have residual sugar. If you drink wines from the 40's, 50's, and 60's, they all had residual sugar. Now some of the greatest wines are completely dry, but this is a relatively new thing. They were making late harvest wines and doing very well with them in the export markets. But you can't make late harvest Riesling every year, it requires certain climate characteristics. It turns out that when climate didn't cooperate, some producers were adding diethylene glycol (an ingredient in anti-freeze) to the wines to give them the texture resembling the late harvest wines." "You've got to be kidding me," I said. I thought it was the French who used to add anti-freeze to wine. Peter just shrugged. "When this was discovered, the Austrian wine industry died, literally overnight," he said. "There were a few growers who decided to change the course, to make great dry wines. They formed a private growers organization called Vinea Wachau, the organization that began using the Federspiel and Smaragd designations. And they weren't always called Smaragd, by the way. It was originally Honifogel but there was a woman whose last name was Honifogel who sued the group and they changed the designation name to Smaragd"
"Who were the growers who started it," I asked. "It was four of them I think," Peter said. "Hirtzberger, the old Jamek, the old Prager, and FX Pichler. It took a little while, but the scandal was the greatest thing that could have happened for the Austrian wine industry in a Darwinian way - only the best survived. Overall quality is great now, in fact I would say that there is no where else right now where the median wine quality is equal to what it is in Austria." "Wow, that's a big thing to say," I said. It was at this point when I noticed all of this light, this burst of knowledge, if you will, pouring forth from Peter's head. "I'd love this to happen elsewhere," Peter said, laughing. "I'd love a scandal in Champagne." We drank the wine and it was delicious with the lobster bisque. It was delicious on its own. Really a great wine, amazingly graceful and balanced, so expressive, a complete wine. And a great experience drinking it in the company of some one who can speak about it so intelligently and also so conversationally. Here's the wikipedia entry on the Austrian wine scandal, if you're curious. I spent the weekend at a friend's house in Martha's Vineyard, perhaps the DRC of New England's summer vacation spots. We did a lot of playing outdoors, and also a good amount of cooking, eating, and drinking. 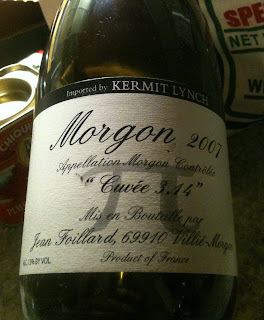 We drank some very delicious things, but the wine I was thinking about when I woke up this morning was the Muscadet. We drank it with oysters and clams, and it was just ridiculous. Everyone says that Muscadet and oysters is a match made in heaven, and they're right. There are plenty of wines that are great with oysters, but Muscadet is a truly special pairing. 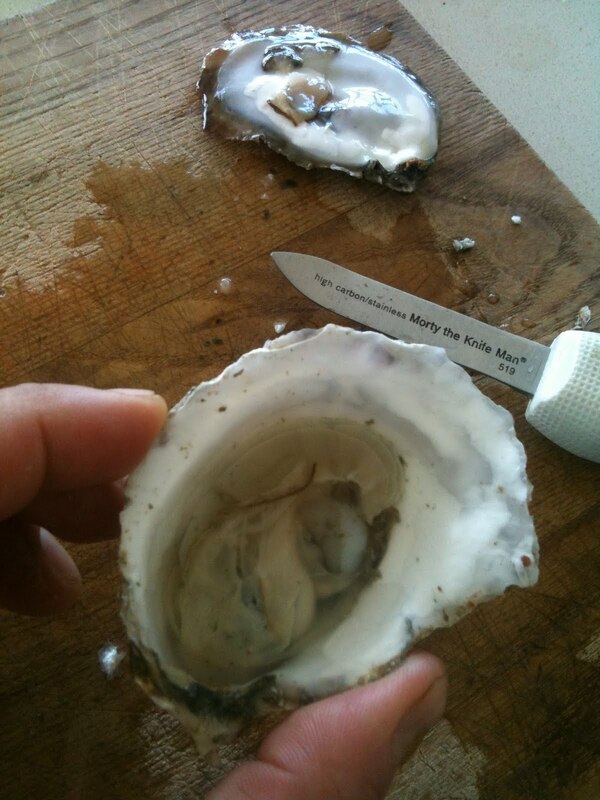 When it's right, the wine amplifies the oyster, and vice-versa, and they almost begin to taste like one another. Or it could be that I'm not a fastidious eater, and liquor from the oyster gets on the rim of my glass, but I think you should ignore that possibility right now and just work with me on this. Most Muscadet is aged for something like 9 months on the lees and then bottled, and these wines can be great. 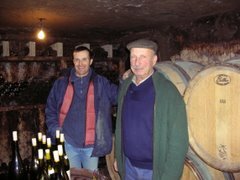 My favorites include Marc Ollivier's Clos des Briords, Guy Bossard's Expression de Granite, and Jo Landron's Fief de Breil. Some of the top Muscadet producers also hold certain wines from old vines and from specific terroirs and age them for two or three years on the lees. These wines can also be great and they offer a slightly different kind of pleasure - they tend to be richer and a bit fuller in body. Marc Ollivier's Granite de Clisson and Luneau Papin's Excelsior Clos des Noelles are two examples that have become easier to find on retail shelves. 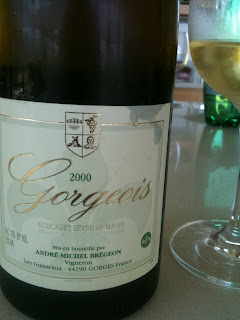 One that is harder to find but well worth the search is André-Michel Brégeon's Gorgeois. 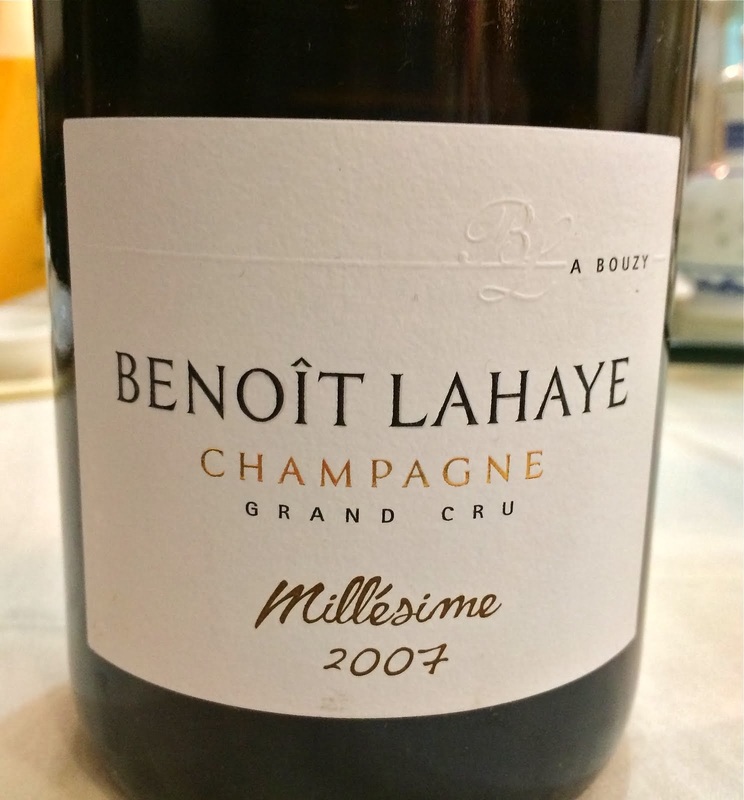 This wine comes from Gabbro soils, the black granite (I think it is granite - please add your .02 if I'm wrong) that sits underneath the clay on the hills around the town of Gorges. The vines are very old and the wine is aged for at least two years on the lees. A few years ago in NYC there was a cache of bottles from the 2000 vintage. I bought a little bit and drank it all, and it was fantastic wine. I was overjoyed to find that my friend had saved a bottle and we drank it this weekend in Martha's Vineyard, with oysters. It's hard to separate the beauty of the wine from the beauty of the experience of drinking it, standing at the sink, oyster and clam shells everywhere, sun streaming in through the windows, the sweet summer smell of the air. The wine smelled like oyster liquor and preserved lemons and anise seed, and it was fresh and lively, still growing. It was perfectly balanced, still vibrant with acidity and minerality, and showed complex flavors that were part saline and part herbs and rocks. At 10 years plus, the wine was not fierce the way young Brégeon Muscadet can be, it had no "attack." The texture is part of what made it so memorable, a gentle pillow that spread evenly through the mouth and nose. We drank this wine with locally farmed oysters and it was one of those moments when you understand why certain things become cliché. The other night a good friend of mine came over for dinner. He's also a wine lover, but his cellar is full of current California Cabernet and modern day wine from Bordeaux. Trust me though, he is a truly lovely guy. He arrived at my house carrying a 375 ml bottle of 2001 Turley Paso Robles Zinfandel Delinquent. 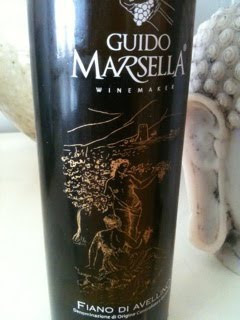 This is a late harvest dessert wine that is not available in stores. You have to be on the Turley mailing list to be offered the wine, and apparently not everyone on the mailing list has access either. It's some sort of Turley secret society, perhaps. I will be honest here - when my pal showed me the wine he brought, I felt a bit concerned. It's so far away from everything that I drink and love - what if I didn't like it? I didn't want to be faced with the choice of critiquing my friend's wine, a wine he loves, or fibbing about liking it. Happily, I never had to make that choice. I didn't love the wine, but it was quite interesting and I'm glad I got to try it. Actually, my friend was more critical of it than I was. And I will point out that this is not the first time in this blog's history where I have been surprised at liking a Turley wine. First, the problems: the wine showed a lot of alcohol. It wasn't so intrusive at first, but 15 minutes in and the alcohol took over the nose, a rubbing alcohol aroma. It ebbed and flowed, but there was no mistaking it. The label says 20% alcohol (and 9% residual sugar), so I suppose that it isn't strange to sense it on the nose. Still, this wine is not handling its alcohol well. That's it - that's the only problem with the wine, if problem is defined as "flaw." Other than that, I was surprised at how much I enjoyed it. There were articulate chocolate and orange aromas, and also something that reminded me of the medicinal herbs that I sometimes smell in northern Italian wines. The palate was spicy raspberry liquor that was very intense without being cloying or heavy. It's a dessert wine made of Zinfandel - not something that I will buy, but by being open minded I found that there were some things to enjoy there. I worry that I might not be open minded enough. Not saying that I should spend more time with California wine, or give the Aussie Shiraz a fair shake. But it's easy to set my mind within the regions that I do know and love, to have decisions already made about which Beaujolais I love, which Vouvray I want, which Burgundy I will buy for young drinking, that kind of thing. This Turley dessert wine was a nice reminder for me that my preconceived notions are valuable and I've earned them through my own experiences, but it is wise also to be open minded, to be eager, almost, to be wrong. A couple years ago I enjoyed a special meal at Convivio, the now-closed restaurant in Tudor City. The inimitable Levi Dalton was of course the chef somelier. When eating or drinking at a master's establishment, I think it's a good idea to simply put yourself in the master's hands - think omakase at a great sushi bar. The master sushi chef knows far better than I about which fish are the freshest and tastiest, and how best to serve them. Why would I select my meal instead of asking them to select for me? Why would I tell Levi Dalton, at his restaurant, what I will drink? 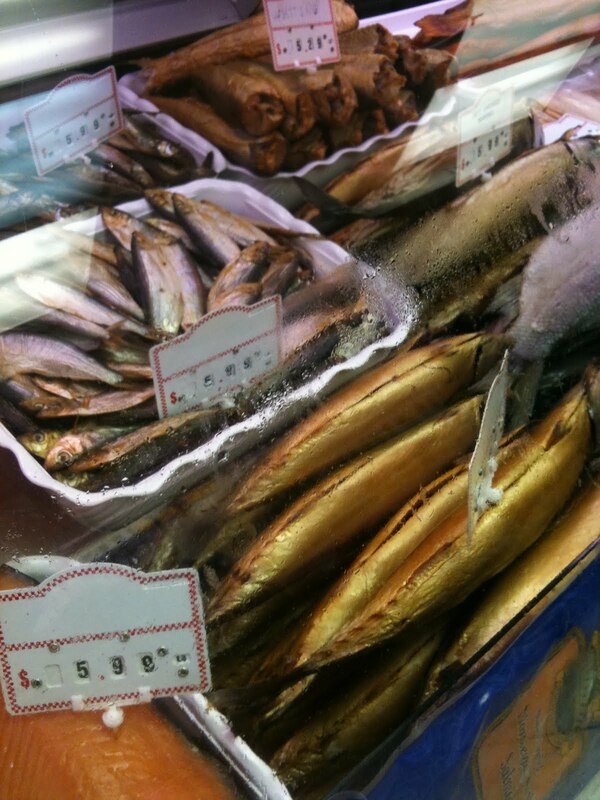 We decided on grilled sardines as one of our first courses. They were pretty much perfect, fresh, smoky, slightly chewy in a tremendously appealing way, and left to shine on their own. Levi served us glasses of a wine I had never heard of with the sardines, a Fiano di Avellino. We ate and drank many great things that night, but one of the most memorable pairings for me was this Fiano with the sardines. And I don't even remember the producer or vintage. What I remember is how the wine introduced and then enhanced the flavors of the fish, clean and pure, smoky, savory, complex, bracing, completely satisfying. Fiano! I needed to have some for my very own. I emailed Levi and asked what to buy. He replied "You want to be looking for Guido Marsella, Pietracupa, Terredora di Paolo (pretty easy to find), La Molara." I couldn't find any of them, in fact I couldn't find any Fiano at all, except for the ones I'd been warned against. Okay, one night a year ago I went to dinner at Vinegar Hill House and they offered a Fiano that came neither recommended nor warned against, and we drank it. It was good, not memorable, but good. Anyway, I'd kind of given up on finding Fiano until I saw recently that one or two of the producers Levi recommended are showing up on NYC shelves. Why now? Maybe it was sir Asimov's article, but who knows. I was glad to see them, and bought a few bottles. I opened one the other night with friends and wow, did I ever pair it wrong. Levi would have been aghast, to say the least. There are Fianos to drink young, but the style that I think is most exciting to people who have tried them are the more serious wines, the wines that do very well with a few years of bottle age. There is a smoky, nutty complexity under the lovely surface of bright citrus, complexity that takes a few years to show itself. I have little experience with these wines, so when I saw the 2006 Guido Marsella Fiano di Avellino, $21, USA Wine Imports, I was pretty excited. Highly recommended producer, a few years of bottle age, very reasonably priced, nice! And then I butchered the pairing. I had a few friends over one night and one of the things I served was the simple and classic fish en papillote, fish baked in a parchment paper packet with herbs and vegetables. It steams as it bakes and the juices are sealed in the packet. It's lovely to cut the paper open at the table releasing the aromas. 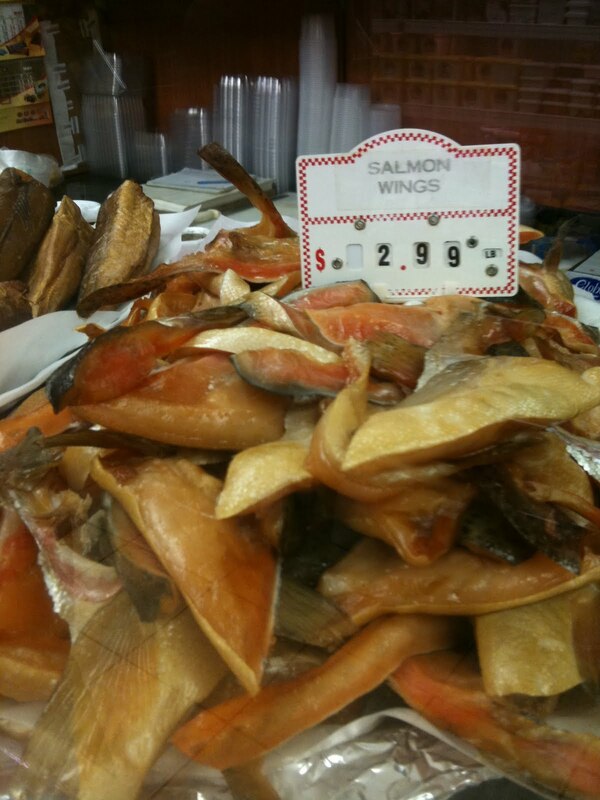 I used local blackfish, a sweet-fleshed fish that eats shellfish. In each packet was little bed made of slices of asparagus, chopped garlic scapes, chopped fennel, parsley, and a pat of butter. The fish was delicious. The wine was delicious. They did not, however, go together at all. The wine was so deep and rich, such intense aromas and flavors of smoke, honey, lentil-type legumes (reminded me of Assyrtiko, actually), and sea salt. One friend said that he was getting bacon on the nose! This wine needed those sardines from Convivio, or something equally powerful, something hearty that could stand up and speak clearly in conversation. This fish preparation was simply too delicate. It would have been better with something like a young Chablis or a Muscadet, perhaps a dry Loire Chenin Blanc. Or a young rosé from Provence. Or anything less intense than this Fiano. Just goes to show that the food can be delicious, and the wine can be great, and things can still go wrong at the table. Don't worry though - no one was hurt, or even insulted. We all actually learned something. The other day I had a somewhat startling realization - when I buy a wine today with the plan to age it for a long time, say 25 years, if I am successful in holding it for that long, I will be something like 65 when I drink the wine. Simple math, you say, and you're right. But the point is, 25 years is a long time - what if I'm not drinking wine when I'm 65? It must be hard to sustain a hobby for 25 years. Honestly, who out there has purchased a wine on release, and then cellared it for 25 years before drinking it? Not many of us, I bet. 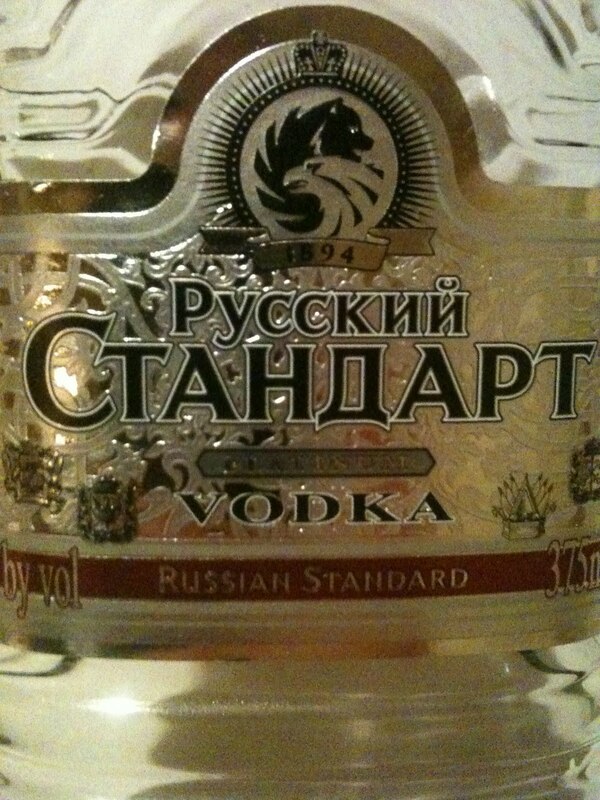 My friend Keith very generously served this the other night with a lovely dinner of roast lamb. There were five of us at the table and I didn't really check in with other people about the wine, I was too busy with my nose in the glass, too busy tuning into the amazing feeling of the wine in my mouth. I thought this was a truly phenomenal bottle of wine, I think the finest bottle of red Bordeaux wine that I've ever had. There were two things about the wine that got me: first, the nose was absolutely pure in its expression of tobacco leaves. I experienced them as fresh leaves, leaves that had been cured in a warehouse in Cuba, but still vibrant and fresh. There were other things happening on the nose too, but it was this amazing fresh tobacco aroma that moved me. And then, there was the texture of the wine, the silky smooth mouth feel. Not glossy, not artificial smoothness in any way, and there was still plenty of structure by the way - just a beautifully textured wine. A pillow of fresh tobacco leaves, with a finish of gravel and faded potpourri. A memorable wine. And the thing is, Keith didn't buy this wine on release - he wasn't born when this wine hit the shelves. I don't know when he bought it, but he said "I bought it back when it was affordably priced. 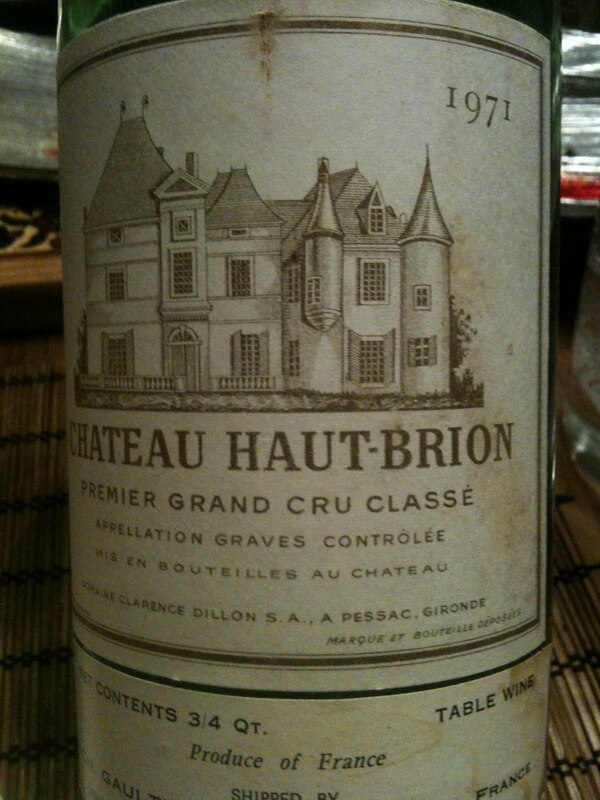 I can't buy Chateau Haut-Brion now." I grew up in New York City and have always loved visiting to its outer reaches, to neighborhoods where you can feel like a foreigner. It's best to go with someone who can act as a guide, but it's also fun to explore with a friend when neither of you really have any idea what you're doing. Recently a buddy and I went to Brighton Beach, the mostly Russian and Central Asian Republic neighborhood next to Coney Island, all the way at the southern tip of Brooklyn. The boardwalk is always a kick, and an entire afternoon can easily be spent wandering there between Brighton and Coney Island. But it is inland where you will feel like you are in another country, on boulevards like Brighton Avenue under the elevated subway tracks, or on Neptune Avenue, where you can stroll all the way to Sheepshead bay. Don't go for the hospitality - that's not the vibe. People in Brighton seem to regard it as an extension of their hometown, and when we Amerikanski go there, speaking our English and getting in the way of things, it's an annoyance, nothing more. That it is New York City is meaningless, at least that's what it seems like to me whenever I'm there. For the price of a round trip subway ride, you feel like you are traveling. 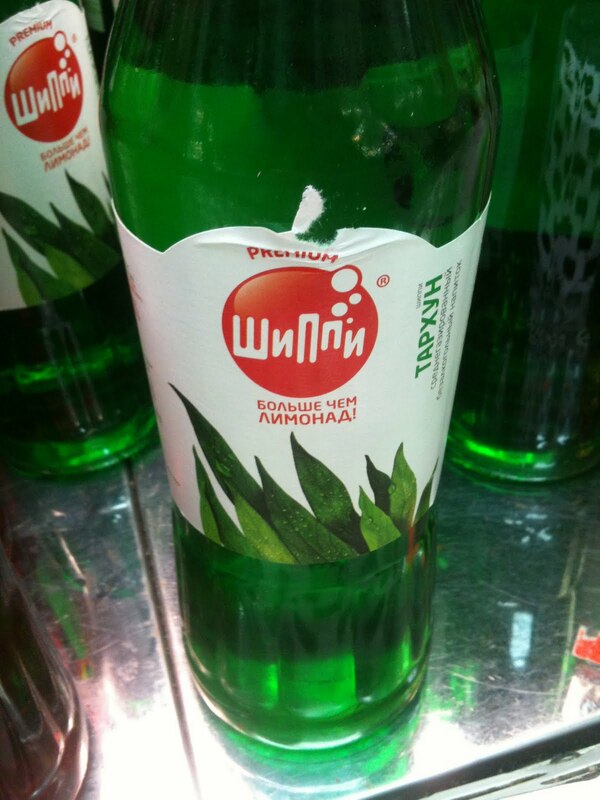 Tarragon flavored drink. Pretty tasty. 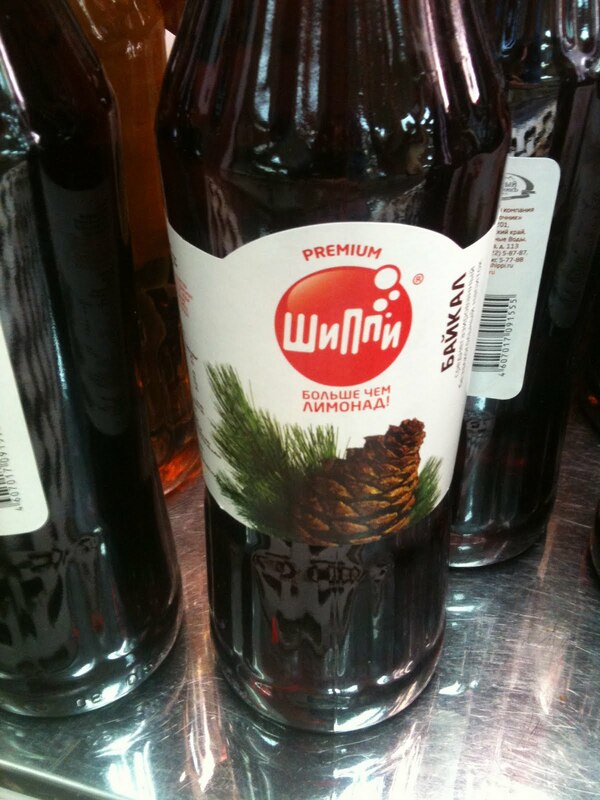 Also comes in pine flavor. Haven't tried it. There is a lot of meat on display. 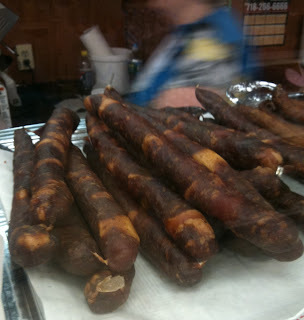 Here are dry sausages. 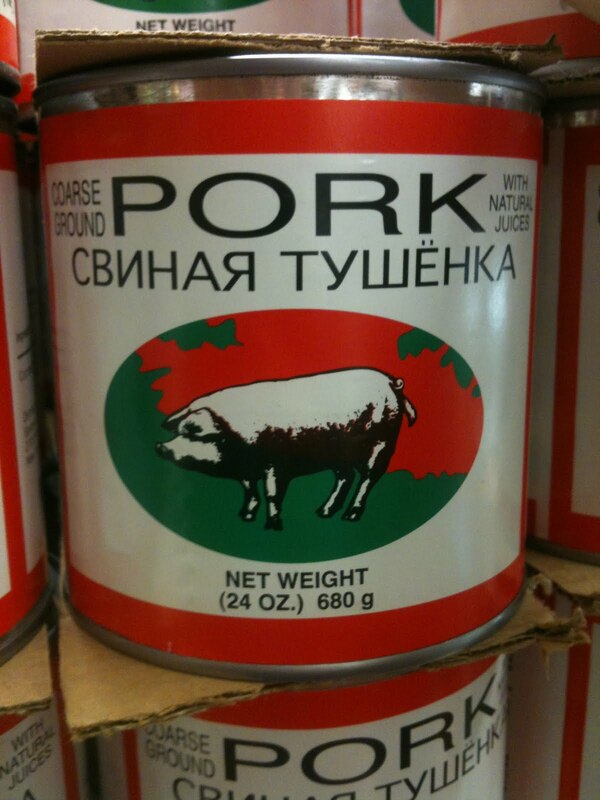 Can of pork. The Cyrillic reads "Svinaya Tushyenka." I don't know what Tushyenka means. I hope it doesn't mean what it sounds like it means. 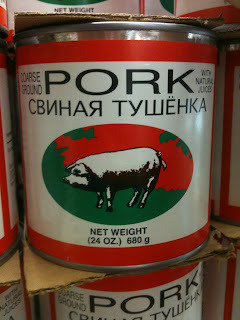 Perhaps not so appetizing, but you have to admire the design. 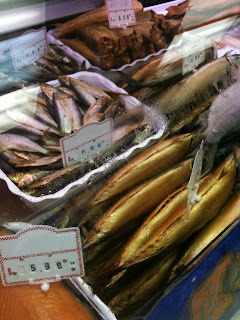 Lots of smoked, pickled, and cured fish too. These smoked salmon wings reminded me of the luscious collar that is often broiled with salt in Japanese cooking. There was evidence also of vegetables. Here are prepared salads. At a bakery, these looked and sounded great - peanut butter layered with wafers. But there was something figgy in there, and I didn't love them. 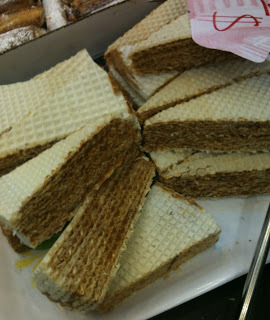 On the whole, the pastry was pretty appetizing. 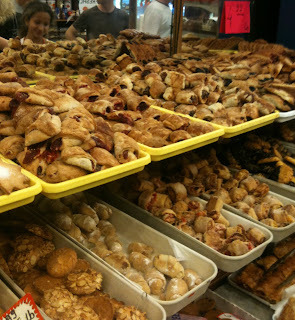 Check out those rugelach! If you drink vodka at cellar temperature and always while eating, you'll never have a problem. 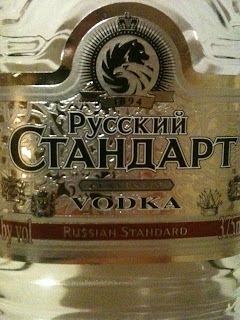 This is the half-bottle of Russian Standard Platinum that I drank with two Russian friends who were kind enough to take me to Brighton for dinner the following week, after I told them of this adventure. There are still boxes and bags cluttering the new apartment, I haven't really unpacked yet. I worked until it reached a livable state, and then I paused, settled in a little. 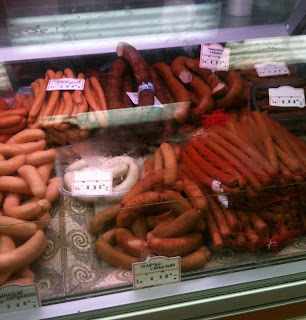 I went to the farmer's market, I cooked dinner. 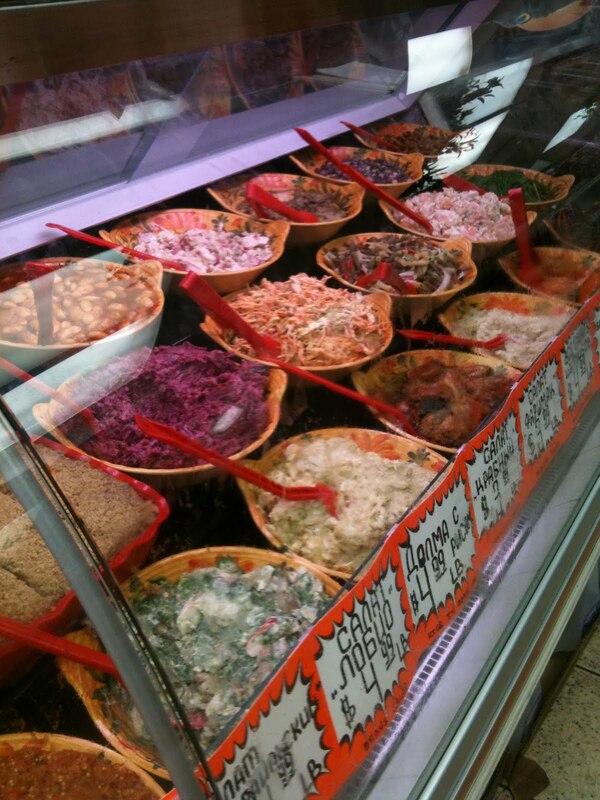 I love the vegetables at the market this time of year. Lettuces, some bitter greens like escarole, garlic scapes, asparagus, now there are shell peas. My daughters have become quite proficient at shelling peas, even the 2 and a half year old. Problem is, and it's not really a problem because it's timeless and adorable, they immediately eat everything that they shell. 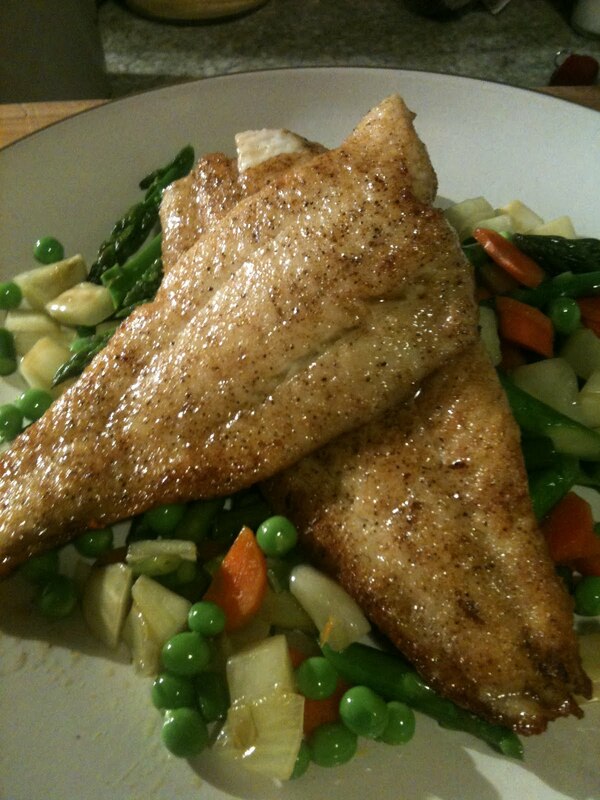 The daughters helped me pick out the vegetables, and my older daughter chose flounder at the fish stand. The younger one stood and stared at the whole sea bass. I made a completely simple and delicious dinner that night, something that the kids happily ate and although a bit simple, I loved it too. Fresh local flounder, salt and pepper, dredge in just the suggestion of flour, cook in butter that is almost-brown at pretty high heat. What's not to like? Served atop a variety of spring vegetables - shell peas, fennel, asparagus, carrots, and garlic scapes, all cut into pieces that a 2 and a half year old can handle. Again, cooked in nothing but butter, salt, and pepper. This meal is not something that you will ever see at Le Bernadin because it's just too simple, among other reasons. I remember reading a quote from some or other celebrity NYC chef, discussing the menu at his new restaurant: "I don't want to go down in history as the guy who cooks fish with salt and pepper." I understand that completely. If you want Mushroom Froth-Pistou Sauce (and I do because it sounds delicious), go to Le Bernadin. But flounder cooked in almost-brown butter with spring vegetables is good too, a different kind of good, and we can all make it at home. It's not hard to pick a wine to go with this dish, most anything will be good, as long as it's not too heavy. I hadn't had a bottle of 2007 Domaine de la Pépière Granite de Clisson, $22, Imported by Louis/Dressner Selections, in a year and I wanted it. It seemed as though it would be fitting for this, the first real meal I cooked in my new apartment. Muscadet is humble, but this wine is not really so humble. Marc Olliver made this special wine from very old vines on Clisson granite terroir by leaving it on the lees for two years. It shows the freshness and lemony aromas and flavors that we expect from Muscadet, a more ample body from the extended lees aging, and as it unfolds it reveals great depth and complexity, and the weightless intensity that you find in wines made from very old vines. I found vivid anise and mineral aromas this time around, and I was especially impressed with the great clarity and elegance of the flavors. 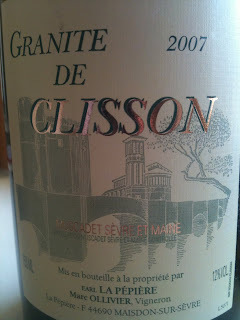 Granite de Clisson is great wine, I think the 2007 is fantastic, and for reasons that continue to baffle me in this age of $50 mediocre Villages-level white Burgundy, you can still find Granite de Clisson on the shelves here and there. You should give it a try if you haven't already. I began writing this blog in September of 2006 and although some things about the way I write the blog have changed, some things have remained constant throughout. I try to write about what I'm learning and experiencing, and why it is important to me. I write about wine and food, not about the other things I feel passionate about. I try to tell a joke here and there. I don't cuss. I write the blog anonymously and I don't go into details about my personal life. Not out of any strong conviction, it just worked out that way. I'm sure you can tell that I've had trouble writing lately, and I think I understand why now. You know how if you have a secret that you cannot figure out how to tell a friend, you wind up avoiding that friend? Until you finally figure out how to come clean, and then you feel normal again. Well, that's how I've been feeling about you, the group of people who read this blog. I have no idea who you are for the most part, but I know you're out there, and I am ready to share my secret with you so that I can stop avoiding you. I want to write and enjoy the blog again. This isn't easy for me to do, and I hope you will read this as therapeutic for me, nothing more than that. But I have to break my rule about sharing the boring details of my personal life. BrooklynLady and I got separated several months ago and we are headed towards divorce. It has been the hardest, saddest, loneliest, strangest, angriest, most hopeless, scariest, most emotionally draining, and most unsettling experience of my life. And we are doing it amicably! I have my kids half the time, and everyone is healthy and doing the best they can. I stayed in the apartment I'd been in in since before I started the blog, but I wanted to move, to have a fresh start. Not so easy, as it turns out. Prices have changed since I last looked, and I need a space that feels good enough to share with my kids, to be comfortable during this transition. I moved, it was a TOTAL debacle and had to move again a month later, but now it's been almost a week and I'm settling in, feeling better about my personal space and more confident about my ability to find balance and perhaps somewhere down the road, happiness. I'm still figuring out how to establish the rhythm for this new life, and I hope you'll be forgiving as I figure out how (and whether or not) writing the blog can be part of my new life. Turns out that this wine pairs beautifully with unpacking a new apartment, by the way. Some of my very best and most beloved friends are people who I know because of this blog. If I never write another post (figure of speech - I know what I want to write about tomorrow night when the kids go to sleep) I'll have that to take with me. 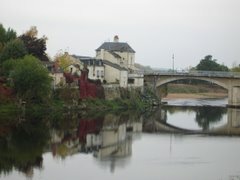 But I hope that coming clean here, sharing something big about myself, will help me to feel normal again about writing. Thanks for listening and for reading, and I don't feel so weird around you anymore.